The recent summit in Hanoi between US President Donald Trump and North Korean leader Kim Jong Un produced no agreement on the North’s denuclearization. Nonetheless, Kim has said he is willing to denuclearize and in Vietnam he offered to shut down the Yongbyon nuclear facility in the presence of foreign inspectors, though the price he demanded in the form of sanctions relief was too high for the Trump administration to accept. The future of US-DPRK negotiations remains uncertain. But if they eventually produce agreements, the disabling and dismantling of North Korea’s nuclear weapons and infrastructure will present enormous technical, logistical and financial challenges. Denuclearization will be a matter for the US and North Korea to negotiate bilaterally and they will carry out the lion’s share of the work. But the United Kingdom (UK) and France can bring physical assets and perhaps some funding to bear to support the dismantlement process and help share the burden. Both the United Kingdom and France have expressed their interest in being involved in the denuclearization of North Korea. Former UK Foreign Secretary Boris Johnson has said that Secretary of State Mike Pompeo asked London to provide its expertise to support denuclearization. President Emmanuel Macron has openly stated that France stands ready to use its expertise to play an active role in supporting North Korean denuclearization. 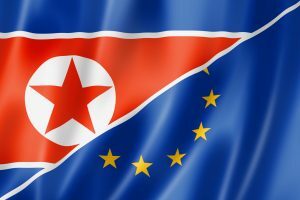 Many US government officials and nuclear nonproliferation experts may be skeptical of the value of involving European countries in the denuclearization of North Korea; they may argue that European countries provide no capacity that is not available elsewhere, and their involvement could make a complex process even more complicated and time-consuming by bringing additional countries to the table. Moreover, North Korean engineers, who built the weapons and the associated infrastructure, are best equipped to play the primary role in disablement and dismantlement—and the US will almost certainly play the lead role in supervising and inspecting these tasks. Inspections: Should the IAEA be called on for inspections, British and French inspectors could be useful in verifying that dismantlement of declared materials is carried out. For example, both the UK and France provided inspectors to United Nations Special Commission (UNSCOM) operations in Iraq—especially the UK. Logistics Support: The UK and France have recent experience and the necessary expertise in the management and handling of nuclear materials. Transportation of nuclear components is a necessary part of North Korea’s denuclearization. The US will want its own experts to lead this process, but the British and French could, if necessary, provide transportation assets. Funding: Few in Europe want to be stuck with the full bill for denuclearization. The European Union (EU) may be willing, however, to provide funds for discrete projects in which they might be involved, such as the purchase and transport of nuclear materials to Europe. Expertise: British experts worked closely with the American team cataloging, verifying and removing Libya’s nuclear program. The United Kingdom also has experience in flying nuclear materials to the United States. Likewise, France also makes use of flights to transport nuclear materials. From a North Korean perspective, there may be political advantages to European involvement in the denuclearization process. Pyongyang almost certainly perceives the EU as a more neutral actor in Korean Peninsula affairs compared to the United States and China. Also, the EU is eager to play the role of neutral facilitator of engagement among the United States, North Korea and the other parties more central to the resolution of the North Korean nuclear issue. In fact, Europe has less at stake than the US, China, Russia, South Korea and Japan, but its member states still want to decrease tensions on the Korean Peninsula and to stop North Korea’s nuclear development and proliferation activities. North Korean officials, in their Track II dialogues with European policymakers and experts, frequently assert that Europe can help to counterbalance what Pyongyang sees as a more hostile US policy toward the North. Similarly, North Korean policymakers seem to have much more distrust of Chinese and Russian motivations than they do of the EU or any of its member states. Thus, it would not be a hard sell to convince Pyongyang that it should accept the presence of British and French nuclear experts in its dismantlement process. Moreover, if the North requested it and there were no technical or logistical concerns, nuclear materials could be transferred to Europe for destruction—initially, perhaps to Scotland, where the UK maintains its nuclear infrastructure. That said, the US would likely prefer that North Korea, like Libya, transfer nuclear materials to Oak Ridge National Laboratory in Tennessee. The UK is probably in a better position than France to participate in North Korea’s denuclearization. It is one of seven EU member states with an embassy in Pyongyang, and North Korea also has an embassy in London. France, in contrast, is one of only two EU member states yet to establish diplomatic relations with the North. Kim would probably not want to give Paris a diplomatic coup by transferring North Korea’s nuclear materials to France, unless he gets big concessions—such as diplomatic relations—in return. Furthermore, the UK has stronger security links with the US than does France. Washington is thus likely to be more comfortable with London taking a greater role in denuclearization than Paris. In the case of both Libya’s nuclear disarmament and the nuclear deal with Iran, European officials and experts were important in the practical implementation and political sustainability of the agreements while they were in place. The presence of Europe conferred greater international legitimacy on both processes, and was not just advancing a more narrow American agenda. Europe’s involvement also helped to build greater Libyan and Iranian trust in the US. For political and psychological reasons, therefore, the US could find it useful to get Europe involved in the denuclearization of North Korea as well. The involvement of the UK and France in the denuclearization of North Korea would be most welcome in Brussels. This is especially true for France, since the United Kingdom will be leaving the European Union. Their participation would give Europe an important role in the actual implementation of an agreement that would represent a diplomatic success. In 1997, the EU became one of only four executive board members of the Korean Peninsula Energy Development Organization (KEDO). Arguably, this was the high point of its involvement in managing North Korea’s nuclear program. Many policymakers in Brussels, however, have bad memories of KEDO. They feel that the EU was basically treated as a cash cow, paying to help run the organization and its projects but without any real say. These feelings of marginalization were further compounded by the EU’s exclusion from the Six-Party Talks. In recent years, the EU has developed a foreign policy strategy that calls for greater involvement in Asian security affairs, largely in response to internal and external accusations that it was punching below its weight in this area. This new foreign policy direction culminated last May with the European Council’s adoption of the Enhanced EU Security Cooperation in and with Asia policy. The proliferation of nuclear weapons is one of the security areas for deeper engagement specifically included in this document. North Korea is not mentioned by name, but its proliferation links with the Middle East are the main concern in Europe about proliferation activities in Asia. The expertise and experience of the UK and France in nuclear weapons stewardship, their neutrality in Korean Peninsula affairs, and the EU’s strategy to get more involved in East Asia’s security affairs could help both countries play a constructive role in the implementation of any denuclearization agreement the US and North Korea might eventually sign. The Trump administration might also see political value in having its European allies taking on some of the burdens of North Korean denuclearization.